The role that companies like Dr. Bronner’s Magic Soaps play in the lives of people like Um Hamza and Abu Saleh is not a small one. As Canaan Fair Trade’s largest single buyer, Dr. Bronner’s sources more than 95% of their olive oil from Palestinian fair trade farmers through Canaan Fair Trade. With Canaan Fair Trade’s exports averaging 400 metric tons of olive oil per year at a value of $4 million per year, hope for a viable local Palestinian economy is sprouting. Canaan Fair Trade’s notable success in specialty food stores, local co-ops and organic shops (such as Whole Foods) has also had a tremendous cross-cultural impact, since for Palestinian farmers the fair trade movement has given them more than just the obvious financial gains. At the same time that Canaan Fair Trade has doubled the price of their olive oil, changing the lives of over a thousand families, it has also built new bridges between different communities that have been separated by political conflicts and cultural stereotypes. 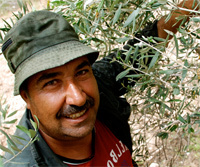 As members of the global green movement, Palestinian farmers are finding their place again in the world, not as “unknown” and marginalized people but as active members of a worldwide network of sustainable development practitioners that is building relationships between people working towards an environmentally sound, economically viable and socially just world. Fair Trade in Palestine in particular has had an immense impact on how people view the West. While most Palestinians are restricted from traveling, their spirits have reached beyond their olive groves into esteemed grocery stores across Europe and the United States and through people who come to visit them. Even as global events and political realities are creating false separations between people, the fair trade and green movements are bringing people back together by highlighting the importance of our environment in preserving our humanity and our connectedness as citizens of one planet. This is why, in a consumer-focused world, which particular bottle of olive oil, cup of coffee or beauty product you buy makes a world of difference, not only in the lives of the producers, but also in the bigger scheme of things where the choice to buy fair trade becomes a decision to learn about someone else somewhere else whom you may have never thought of before.